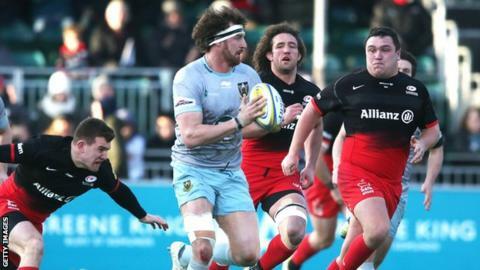 Northampton flanker Tom Wood says the Saints must "peak at the right time" to secure a top-four finish this season. Saints are fifth in the Premiership after they beat leaders and reigning champions Saracens 20-15 at Allianz Park. "A couple of losses and we'd be almost out of it, but a couple of wins puts us right back in the fight," said Wood. "It's not about topping the table, it's about peaking at the right time,"
Jim Mallinder's side, who lost in last season's Premiership semi-final despite finishing top of the table, have won four of their last five matches and host Sale Sharks on Saturday. Meanwhile, Wood says he is finding positives in his absence from England's Six Nations campaign. The 29 year-old, who has 42 caps for his country, has not featured since the hosts failed to progress beyond the group stage at last year's World Cup. "As much as I'd like to be in the set-up, the one benefit is that I know where I am," he told BBC Radio Northampton. "I get some family time and get to be out of the white-hot intensity of international rugby. "With three kids I have to watch plenty of Disney films, but I can't help but watch the England games still."